This card means that a person has achieved everything he wanted, and thus his development may come to a dead end. Having everything, he no longer seeks anything and this can lead to spiritual stagnation and indifference. If this card happens to appear when practicing divination on a person’s character, the Four of Pentacles indicates that this person doesn’t have a pleasant character, he’s greedy, rude, has lack of ability to look forward, has poor intuition and is questioning everything new. Such person will always be confident in his opinion, even if it is absolutely wrong, and moreover he’ll try to persuade everyone else that he is right. If this card happens to appear when practicing divination on a specific situation, the Four of Pentacles is an indication that it will be extremely difficult to achieve a desired result, since the path will be strewn with a variety of obstacles. In relation to the Major Arcana, the Four of Pentacles sometimes suggests that a person doesn’t have enough information to carry out his plan. He also might not have the complete information or maybe simply isn’t prepared to accept something new. Four of Pentacles is reliable and there is no room for chance. The success is legitimate and is a consequence of hard work. The Four of Pentacles card may symbolize small, gray and dull home life. It means security, reliability, clean house, financial stability (tiny, but a regular pension) and health. A person that reached success, but not a big one. 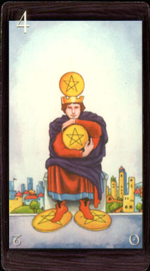 However, the Four of Pentacles can sometimes mean greed. Lack of generosity, explained by unseemly excuses such as “I have a family and children”. Negative events, money loss, chaos in a world, especially at home, disorder in affairs, inability to collect, organize, obstruction, lack of steady income and waste of time. Reversed Four of Pentacles card is associated with a concept of boundaries and symbolizes the fence or any other kind of division.